Visible Ink Press : This superhero, originally a rival to the Fantastic Four, became a hero himself and was especially popular to fans during the 1960s counterculture age. This superhero, originally a rival to the Fantastic Four, became a hero himself and was especially popular to fans during the 1960s counterculture age. The love of his life is Shalla Bal, a woman he can never have due to circumstances beyond his control. He became a superhero to protect his race from a planet-eating entity. One of his biggest nemeses is the devilish Mephisto. He's bald and travels through the air on a surfboard. Though first introduced into an issue of Fantastic Four as an afterthought, the Silver Surfer has become one of the great icons of comics and is an enduring cult favorite. In early 1966, Fantastic Four #48 was originally intended to feature the superhero team in pitched battle with a new enemy, the colossal, planet-eating alien Galactus. But when Jack Kirby presented his penciled page, writer/editor Stan Lee had a real surprise: Kirby had dreamed up a new hero--a bald, silver man flying through the sky on a silver surfboard, possessed with cosmic power, and apparently acting as Galactus' herald--and simply inserted him into the story. Whatever his genesis, the public (and Lee) took the "Sentinel of the Spaceways" to their hearts, and more appearances in Fantastic Four followed soon after. The initial Fantastic Four story ended with the Surfer, touched by the humanity he saw on Earth, turning on Galactus and persuading him to leave the planet alone. Galactus agreed, but punished the Surfer by erecting a barrier around Earth that would keep him restricted to the planet, ensuring years of heartbreak, angst, and mourning for the tortured herald. In the psychedelic 1960s, both the fans and the growing counter-culture movement adored the Surfer, seeing in his James Dean-esque emoting a reflection of their own insecurities and confrontations with society. Indeed, the Surfer himself had much to say about the hot topics of the 1960s--namely, war and peace--Lee himself admitting that he wrote his "most obvious moralizing" through this character. By 1968, the clamor for the hero had grown to a fever pitch and Lee bowed to the inevitable by giving the Surfer his own comic, complete with a long-delayed origin story and (much to the surprise of Kirby) a new artist, the elegant John Buscema. The Surfer's origin, detailed in Silver Surfer #1 (1968), tells of how Norrin Radd, from the planet Zenn-La, becomes Galactus' superpowered scout in order to save his people from the planet-guzzling titan's terrible appetite. Radd has become dissatisfied with his undemanding life on the paradise-like Zenn-La and jumps at Galactus' offer of a life in the stars, reasoning that he could find uninhabited planets for his master to devour and save countless civilizations in the process. ("On and on he soars, dodging meteors--skirting around asteroids--rocketing from planet to planet--with entire galaxies as his ports of call.") However, in accepting a future at Galactus' side, he has to leave the love of his life, the beautiful Shalla Bal, behind, inducing centuries of wistful pining, as the people of his home planet are conveniently immortal. Under the great classicist Buscema, Silver Surfer was one of the decade's high points. Exciting, dynamic, and expansive, each issue was a treat for the eyes. However, readers soon became aware that Lee was unsure where to take the title, and Marvel's decision to launch it in an expensive sixty-eight-page format put many potential buyers off. Issue #3 introduced the Surfer's nemesis, Mephisto--Marvel's answer to the devil himself, complete with pointed ears, sharp teeth, red skin, and flame-filled Stygian lair. Lee had Mephisto tempt the increasingly Christ-like Surfer with riches, power, and women, finally offering him a life with Shalla Bal, if he would only join him in a career of evil. Inevitably, the Surfer rejected these temptations only to see Shalla Bal whizzed off back to Zenn-La; Mephisto would regularly drag the poor girl into his plans over the next couple of years. As the Surfer's moanings and posturings continued to escalate, fans deserted the comic, and after eighteen issues Marvel threw in the towel. Lee had seen the title as an outlet for his musings on American consciousness, and had reveled in the opportunity to indulge his taste for Shakespearean speeches, but possibly at the expense of the fans' yearning for action and characterization. 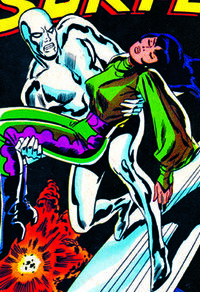 Throughout the 1970s, the Silver Surfer was a regular guest star in numerous issues of the Fantastic Four's comic and was a popular member of the Defenders, as well as being a potent iconic symbol for the cognoscenti. In 1978, Lee and Kirby were reunited for a final time on an all-new Silver Surfer trade paperback, published by Simon & Schuster--one of the first graphic novels. The story was an alternate take on the Surfer's first journey to Earth, excising the Fantastic Four from the proceedings, and was possibly intended to be the blueprint for a Silver Surfer movie. Rumors persisted throughout the late 1970s that a Silver Surfer film, starring pop singer Olivia Newton John as Shalla Bal, was imminent, but it never materialized, and there was a sense that the character's popularity was on the wane. A long fallow period in the 1980s, punctuated by a 1982 one-shot, unexpectedly came to a close, in 1987, with a new Silver Surfer series, which this time was a resounding success. Writer Steve Englehart immediately freed the Surfer from his reluctant exile on Earth, correctly seeing that fans would love to explore the wider universe out there. For its first few years, this second series featured all sorts of aliens, the warring Kree and Skrull empires, Galactus, and, inevitably, Shalla Bal. In an intriguing twist, the Surfer was finally able to propose to his beloved, but she rejected him, feeling that the pair had grown apart over the centuries. The 1990s tied the Surfer into new writer Jim Starlin's menagerie of cosmic stars, including Captain Marvel, Warlock, Pip the Troll, and the villainous Thanos. While no longer the critics' favorite that he had been in his early days, the period starting with the Englehart series was the Surfer's commercial high point, resulting in a stream of specials, graphic novels, toys, and merchandise. Lee enjoyed occasional reunions with his old favorite, including a 1988 collaboration with the legendary French artist, Moebius, on a short book called Parable. In the Surfer's own title his writers began to play around with his history, including a revelation (in issue #48) that, back in the distant past, Galactus had tampered with his soul so that he would agree to become his herald. Other plot twists included the death of Shalla Bal and the destruction of Zenn-La (both inevitably reborn later) and a showdown with Mephisto (again). The comic's last years were perhaps not its finest, and included Shalla Bal falling in love with the Surfer's (previously unmentioned) half-brother, and the unconvincing revelation that Zenn-La had been destroyed thousands of years earlier and had been an illusion ever since. The sense that, after ten years in the limelight, the character had finally run out of steam was confirmed by the comic's cancellation in 1998, with issue #146. However, the same decade saw him make it to America's TV screens if still not its multiplexes, as a well-regarded Silver Surfer animated series ran from 1998-1999. A co-starring role in Marvel's early 2000s Defenders revival was followed by an atmospheric new comic of his own that lasted from 2003 to 2004. After numerous guest appearances in other series, the Silver Surfer starred in a new miniseries in 2011. In his most high profile appearance to date, the Silver Surfer was one of the title characters in the 2007 Twentieth Century Fox film Fantastic Four: Rise of the Silver Surfer. The Surfer that audiences saw onscreen was a combination of actor Doug Jones's physical performance, Laurence Fishburne's voice, and CGI (computer-generated imagery) effects. Constant reprints of the Silver Surfer's first series (now fondly regarded as a classic) and of his early encounters with the Fantastic Four, as well as high-priced collectibles such as statues and action figures, will doubtless ensure his status as one of America's most memorable heroes.